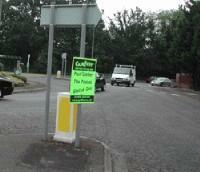 Fly-posting is unsightly and can be dangerous if it obscures vision at traffic islands or busy junctions. It is also illegal to advertise in this way. Councils have a legal duty to remove fly-posting from public buildings. For private buildings this is the responsibility of the property owner. If you see large or public companies that are using fly-posting as a form of advertising you can write to them and complain. The more complaints they receive, the more that they will understand that the public are not happy for their environment to be spoilt by fly-posting. Graffiti spoils the local environment, making the area look run down and feel unsafe. Property owners are responsible for removing graffiti from their own property, including utility and bus companies. Oadby and Wigston Borough Council is responsible for removing graffiti from public buildings, street furniture or monuments. If we receive a complaint related to graffiti on private property we will request that it is removed. If it is not removed in a reasonable timescale we can serve a Defacement Removal Notice which requires clearance within 28 days. If the property owner fails to remove it, we can do the work ourselves and recover the costs. If you are affected by graffiti, or you see it on property nearby, you can report it to us. You find out more about graffiti from the Keep Britain Tidy website. Fly-tipping is ‘the illegal deposit of any waste onto land, or any waste dumped or tipped on a site with no licence to accept waste’. This often occurs out of site in dark lanes or land which is not in use. 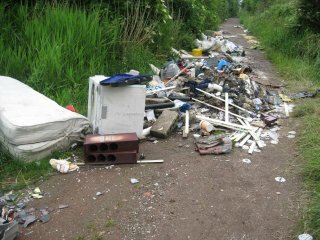 We carry out surveillance on fly tipping and prosecutions can be made if evidence is found. The Council offers a rubbish collection service for a small charge, so there is no excuse for dumping it illegally. 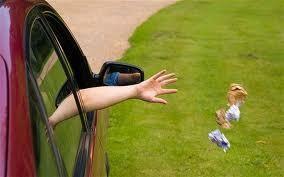 Anybody seen dropping litter, even if it is thrown from a vehicle, can be issued with a Fixed Penalty Notices.Litter is constantly changing, but generally it includes synthetic materials associated with smoking, eating and drinking that are improperly discarded by members of the public. To report an Environmental Crime please complete the online report form or call crime stoppers.